In May 1998, I had the privilege of interviewing Professor K.D. Irani over a 4 day period, and recorded all of it. Professor and I discussed every topic that came to mind. On day 1, we talked about his life, his experiences with Albert Einstein and other giants of physics, his life in India as a child, his college days, his father, his mother, his venturing into Law practice, how he met his wife, his move to the United States, and his many years at City College in New York. On day 2, we talked about his faith - Zoroastrianism - what were the teachings of Zarathushtra, how to practice them, how they have changed over the past millennia, and about the Zoroastrian community of today. On day 3, which was undoubtedly the climax of the interview, we discussed what he calls his "original contribution to philosophy", and that is his thesis of "Domains of Belief". On day 4, we discussed how his thesis can be applied to day-to-day life, as well as to social institutions such as the justice system, the medical and healing institutions, the education system, the family... and we concluded the day with an emotional farewell. We produced over 15 hours of raw material from these interviews, which has been distilled into a 4-hour program, and made available on a set of 2 DVD's. "Domains of Belief: An Interview with Professor K.D. 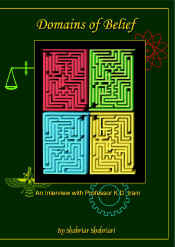 Irani" is a wonderful introduction to the thought, humanity and charm of Professor Irani. For those who have been his students these DVDs will bring back the pleasure and clarity of his philosophical expositions as well as the delight of hearing about his interactions with some of the greatest minds of the 20th century. To those encountering him for the first time there will be new and exciting ideas to consider and new paths to explore. What emerges most clearly is Professor Irani’s depth of commitment to uncovering the ways in which we can come to understand the complexity of the world while living together wisely.